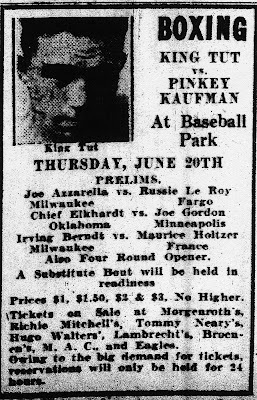 From the first one on July 27, 1926 to the last one on July 25, 1949, 16 professional boxing promotions were held at Borchert Field. 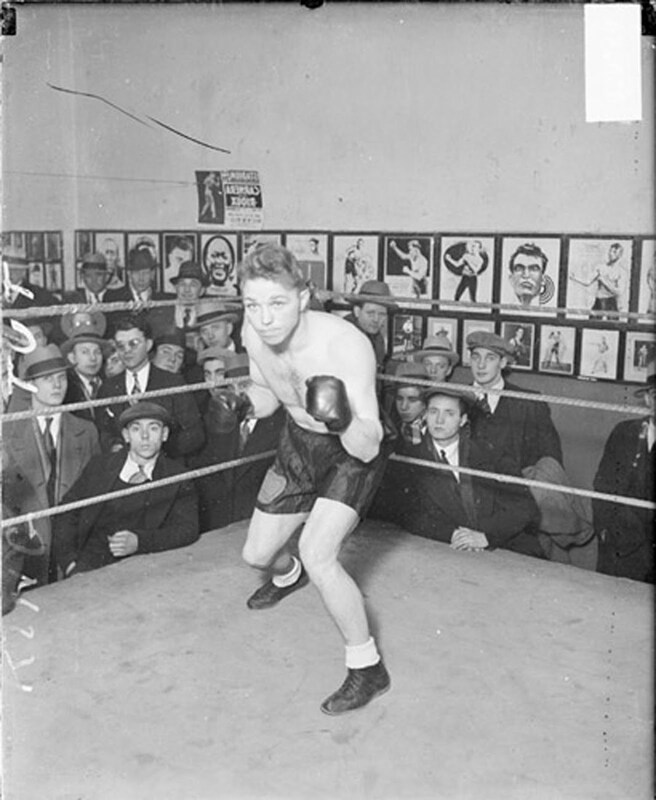 They were headlined by such top local attractions as Joey Sangor, Pinkey Mitchell, Doll Rafferty and Jimmy Sherrer, and future Boxing Hall of Famers Max Schmeling, Benny Bass, Gorilla Jones and Harold Johnson. 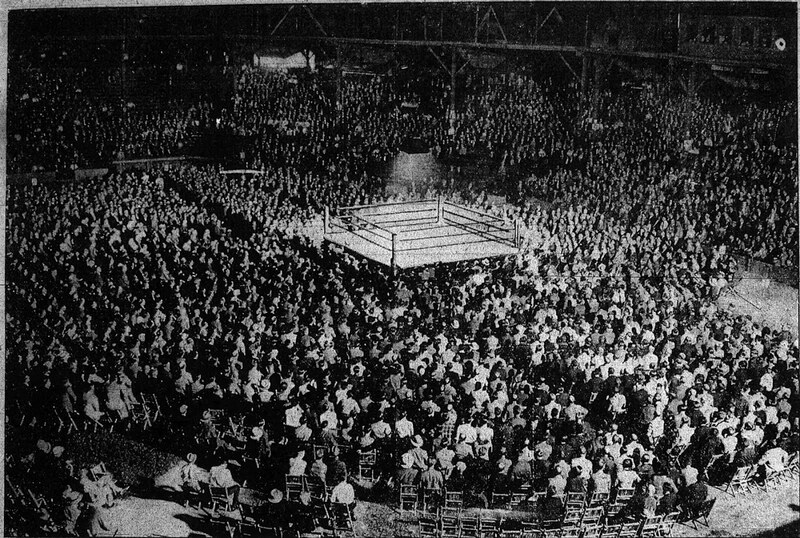 But the fact is that despite Milwaukee's reputation as one of the country's best fight centers, unlike New York City, Chicago, Philadelphia and other big cities where ballpark boxing was a popular staple of hot summer nights, thanks to bad matchmaking, bad planning or just plain bad luck the efforts of local promoters to fill the stands on fight nights at 8th and Chambers mostly struck out. The closest thing to a pugilistic home run there came on a perfect night 83 summers ago when 9,000 fans were lured to the Orchard by the irresistible spell of King Tut. His real name was Henry Roland Tuttle, and he was born July 2, 1905 in Wonewoc, a village in Juneau County about 50 miles north of Madison. Then as now, Wonewoc was a magnet for mystics, tealeaf readers and dabblers in swamiism who still trek there to get in touch with their pasts and have their futures foretold at the 138-year-old Wonewoc Spiritualist Camp. When he was 12 years old, a vision of what his life would be like if he stayed in Wonewoc spurred Henry Tuttle to run away from home and not look back. He headed west and over the next decade worked in Wyoming oil fields and cowboyed in Montana. 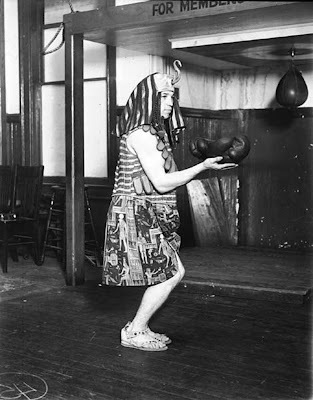 The most colorful version of how he morphed into King Tut, gloved scourge of the ring, starts on the day Tuttle and some fellow wranglers visited a traveling carnival whose main attraction was a female wrestler offering $10 to any man or woman weighing up to 140-pounds who could last 15 minutes with her on the mat. Tuttle, then 115-pounds, picked up the gauntlet and promptly found himself imprisoned in a scissors hold by the Amazonian rassler. According to his pal Jack Dempsey, the 1920s heavyweight champion, Tuttle "forgot she was a lady…broke the hold, lifted her up and slammed her to the mat. The fall busted her up so much she had to quit the job." When the carnival pulled up stakes for its next engagement, its new wrestling champ, rechristened "King Tut" by the owner to cash in on the public's fascination with the young pharaoh of ancient Egypt whose tomb was discovered in 1922, went along. Tut beat all comers until somewhere in Iowa a challenger twice went the distance with him and won $20. Tut then offered the guy another $5 if he could last four rounds with him with boxing gloves on. He scored a first round KO, and promptly switched sports and careers. Tut headquartered in Minneapolis and later in Milwaukee, and wherever he fought the 5'5", 135-pounder's frenetic style in the ring left opponents and sportswriters alike gasping. "There is nothing cute in the King's work," wrote Sam Levy in the Milwaukee Journal on October 18, 1928. "He tears across the ring the instant the gong sends him away and doesn't let up a relentless attack until the bell orders him to take his minute's rest." Wrote Jim Delaney of the Wisconsin News: "The boxer who is fated to fall before Tut is better off if the undertaker is called in a very early round, for Tut starts to wear them down until they finally collapse from sheer weakness and pain, and they are not any good for a long while after." When he added Tut to that list by stopping him in the second round, Kaufman's win was called "one of the season's biggest fistic upsets." King Tut called it a fluke. "It was a good lesson to me and will do me good," he said of the fight. "I walked out against Kaufman saying to myself, 'Another sucker.' I got what was coming to me. But I learned my lesson." The stars Pinkey Kaufman made Tut see looked like dollar signs to Benjamin Franklin Steinel. One of Milwaukee's leading boxing impresarios in the early 20th century, Steinel had been out of the game for a decade when he jumped back in with both feet in May of '28 by signing a contract with Milwaukee Brewers vice president Louis Nahin to promote boxing at Borchert Field that summer. 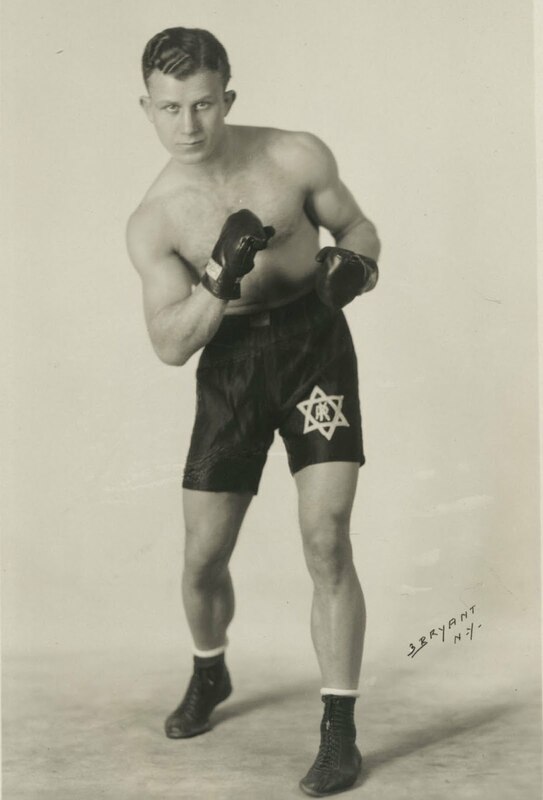 His first card on June 20 would feature a rematch between Kaufman and the Wisconsin fighter the Milwaukee papers had christened the "Wonewoc Wasp." The Sentinel's Ed Dunn called it "the best outdoor boxing carnival yet drawn up for consumption by the Milwaukee and Wisconsin public," and the public seemed to agree. Five days before the rematch, reported A.J. 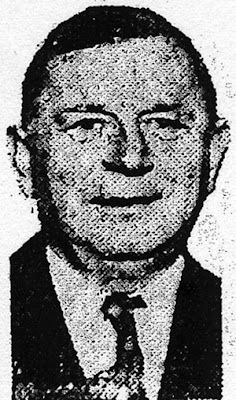 Schinner in the Wisconsin News, "(ticket) orders thick, fast and heavy are flowing in on the Milwaukee promoter from all sections of the state," and Morgenroth's bar/restaurant/betting emporium on W. Water St. that was the city's sporting headquarters reported "the heaviest opening day sale in fistic history." Tickets ranged from $1 for grandstand seating up to $3 for ringside. "The seating capacity of the park is so large, we can afford to limit the prices and still attract a big gate," said promoter Steinel. "The entire grandstand will be utilized and chairs will be placed in the infield. The ring will be pitched over home plate and none of the seats in the field will run back further than the second and third base. With the arrangement, we can seat 15,000, which will be a record crowd for Milwaukee if there is a sellout." Since professional boxing was legalized in Wisconsin in 1913, the largest attendance at a fight had been the 8,834 at the Auditorium for the world lightweight title bout between champion Willie Ritchie and ex-champion Ad Wolgast on March 12, 1914. "Biggest Crowd in History of Game in State Expected to See Card," headlined the Journal sports section on the afternoon of the Tut-Kaufman fight. The story reported that "practically all the top priced ducats have been sold and there is expected to be a great rush for the one buck seats, 4,000 of which were put on sale at the ball yard early this morning." The Orchard was two-thirds full when ring announcer Rusty Hagen introduced the fighters in the first four-round preliminary bout at 8:30 p.m., but then the turnstiles started whirling, and the next morning George Downer wrote in the Sentinel that "The jam around the gates…must have made Lou Nahin wish he could trade his interest in the Brewers for a fight club." 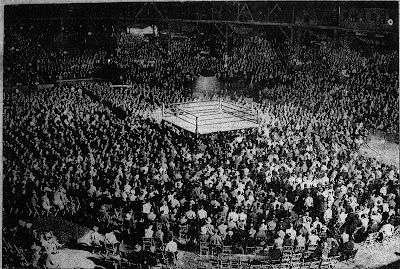 The 9,000 fans packed into Borchert Field didn't match Steinel's best-case scenario, but it was still a new paid attendance record for Wisconsin boxing that would stand until the May 9, 1950 fight between ex-middleweight champion Rocky Graziano and Vinnie Cidone drew 12,000-plus to the brand new Milwaukee Arena. They all came to see the fighter Sam Levy called "a cruel-hearted warrior with murder in his eye," and King Tut didn't disappoint. Two minutes after the opening bell, he knocked Kaufman down for a count of nine. After that, the visitor expended most of his energy on clinching, ducking and running away from Tut, and though Kaufman stuck around till the last bell "his mind was scrambled and his legs were weary," wrote Manning Vaughan in the Journal. The decision for Tut after 10 rounds was a formality. The futures of the Wonewoc Wasp and ballpark boxing in Milwaukee seemed as gaudy as the full moon hanging over Borchert Field that night. But like that lady rassler in the traveling carnival, both were headed for an unexpected fall. Tut's fade started after Billy Petrolle knocked him out at New York's Madison Square Garden in 1931. Within a few years he was back in wrestling tights, grunting in front of small crowds at Milwaukee's Bahn Frei Hall. He'd gotten $5,000 for beating Kaufman, the equivalent of almost $66,000 today. Kaufman got $3,500. When he was done paying everybody off, Ben Steinel made less than a grand on boxing's biggest night at the ballpark. He tried again on July 10, importing middleweight contender Rene DeVos of Belgium for his next main event at the Orchard. About 2,500 fans turned out for that one, and when only 900 showed up for his third ballpark card on August 28, featuring local hotshot prospect Dave Meier, Steinel lamented that "The boxing game isn't what it used to be" and went back into retirement. But thanks to him and the two-fisted reincarnation of Egypt's Boy King, the curse on boxing at Borchert Field was lifted for one night. I have pictures from this article, originals. By Benjamin Franklin steinel a book full of his boxing travels with clippins and pics. Shoot me an email ("Contact US" link at right) - I'd love to talk to you about them.